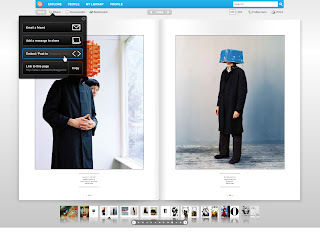 ISSU = An online publishing service that creates products which mimic physical magazines. I've seen online publications, especially catalogs, take advantage of vector-based graphic designs that mock the appearance and physical characteristics of magazines. Issu opens the gates to let non-programmers create dynamic online periodicals, and it does so free for non-business users. Users upload their document, and Issu converts the document into flash. Issu presents the pages as if they were bound with shading down the inner spine as well as other rendering techniques, and it is much more dynamic and fluid than a PDF. ISSU has also built in features like commenting, rating, and embedding features for social networks. I think the last point is particularly important for getting your product in front of as many users as possible. The only critical points I have regard ISSU's zoom feature. ISSU's zoom feature acts shaky as you pan across the pages, and it is difficult to control. Additionally, it would be nice if the scroll on your mouse controlled the zoom while in the zoom feature (ala Google SketchUp) versus the vertical viewing aspects of the page. In all, I think ISSU is a worthwhile endeavor, and it might be something to investigate for an organizational newsletter, etc.